Meta Box AIO is a part of Developer and Lifetime Bundles, which contains all the extensions. This extension allows you to just install 1 plugin and have everything in hand. So you can shorten down the plugin list and never get lost in a lot of plugins provided by Meta Box. For more information, please see this blog post. The extension has a settings page under Meta Box → All-In-One, where you can enable/disable the modules you need/don’t need. Simply check/uncheck the checkbox to enable/disable the corresponding extensions. Then click Save Changes. 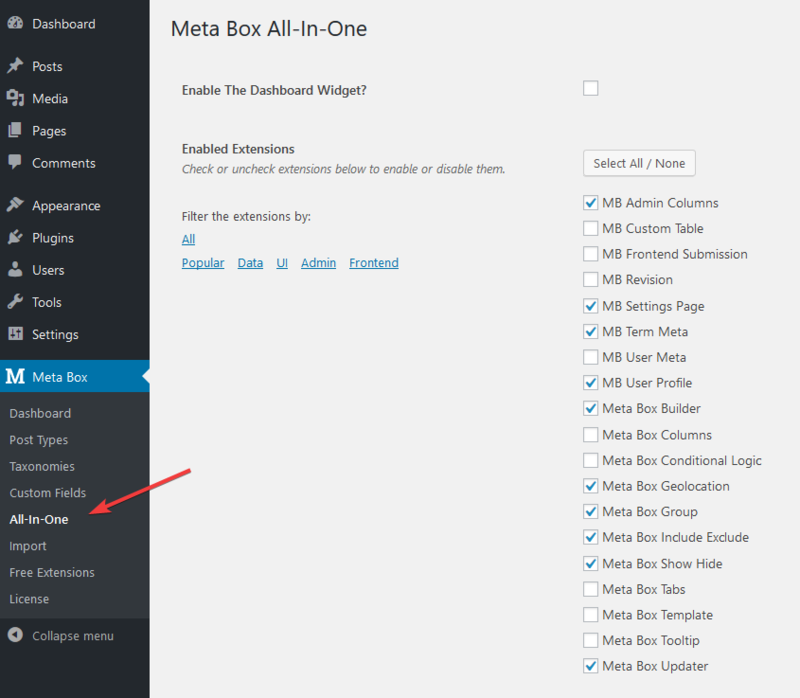 Please note that you still need to install Meta Box plugin to see the admin menu. Simply click on the Begin installing plugins to install them (if you haven’t). And then click Begin activating plugins to activate them. This filter is used to show/hide the settings page. The callback function should return true to show the settings page, or false to hide it. This filter allows you to change the list of enabled premium extensions. Thus, enable/disable modules by just coding. This filter takes a list of enabled extensions (their slugs), and returns the filtered list. This filter allows you to show/hide notification to load free extensions from wordpress.org. The callback function should return true to show the settings page, or false to hide it.